We’re pleased to announce that the 12 films shortlisted for this year’s competition are now available online! Watch the films now, vote and comment on your favourites. We received over 640 entries from 45 countries, from India to Germany, and of course the UK. We were astounded by the standard of the films we received. It’s been a tough decision process, but we’ve whittled the entries down to the 12 films you’ll find on this year’s shortlist. These films stood out for their originality, imagination and ability to engage, and are now in the running for the main DepicT! Award of £1500, the British Special Mention Award and the DepicT! Random Acts Special Mention presented by Channel 4. For 2013, we are also delighted to team up with The Royal Photographic Society to introduce the DepicT! 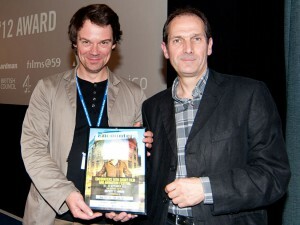 RPS Cinematography Award, also selected by the Jury. As a result of this new partnership with the Royal Photographic Society, the cash prizes have doubled to a mighty £3,000 including £500 up for grabs for the winner of the Shooting People RPS Audience Award – vote for the winner at depict.org! At Encounters Short Film and Animation Festival we’ll be hosting a big screen premiere and Q&A with the filmmakers, followed by a panel on the possibilities of the ultra-short film format. Catch the DepicT! 2013 Showcase here at Watershed on Saturday 21 September, 3.30pm, followed by a reception in the café/bar link area sponsored by Bath Ales. If you are a young filmmaker aged 21 or under, there is still time to submit your short film to Electric December, Watershed’s annual countdown calendar showcasing the very best shorts made by young filmmakers from across Europe.